But just in case I wanted to cover some of the other things we have available that you might want to join in. Of course we have a Facebook page—who doesn't these days? Then I've also created the Aussie Weekly. This has been confused with this newsletter but it's not a newsletter at all. The Aussie Weekly comes out—well, weekly—and is a special feature that's meant to be a bit lighter and offers things like photos, info, cartoons, quotes and puzzles for fun. Then we have our forums—Q&A, Reader's Aussies and Aussie Art where you can share and get feedback from other Aussie Lovers. If you haven't had the chance to check them out be sure to give them a try and let me know what you think. Forward this newsletter to anyone you feel would also benefit from this information. If someone you know has forwarded this newsletter to you, you can subscribe here to make sure you automatically receive future issues. I've finally had a chance to join Pinterest. Here's the link to our Pinterest page. You will also notice as we go forward I will be including a "Pin it" button on our feature photos to make it easy for you to pin photos to your boards. If you would like to follow us on Pinterest you can use the button below or click the "Follow Us on Pinterest" button you will find on every page of the website (top of right side column). Are you considering getting an Aussie? Why not get an rescue Aussie in need of a loving home like yours? Combine a beautiful Aussie with a beautiful location and you get this month's Photo of the Month of Jasper sent in by Todd Wynia. Thanks Todd! 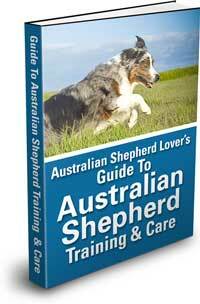 Did You Get Your Copy of The Aussie Ebook Yet? Note: This is an Ebook in PDF format that you download (no shipping fees or waiting). Book cover shown for illustrative purposes only. "My cats inspire me daily. They inspire me to get a dog!" Calling All Breeders—If you are an Australian Shepherd breeder please make sure your listing is up to date. I have made many improvements to the Premium Listings (and dramatically reduced the annual subscription). Whether you opt for that or want to continue with a f'ree listing I still need to hear from you. You can find out more at the following link or email me if you have any questions.